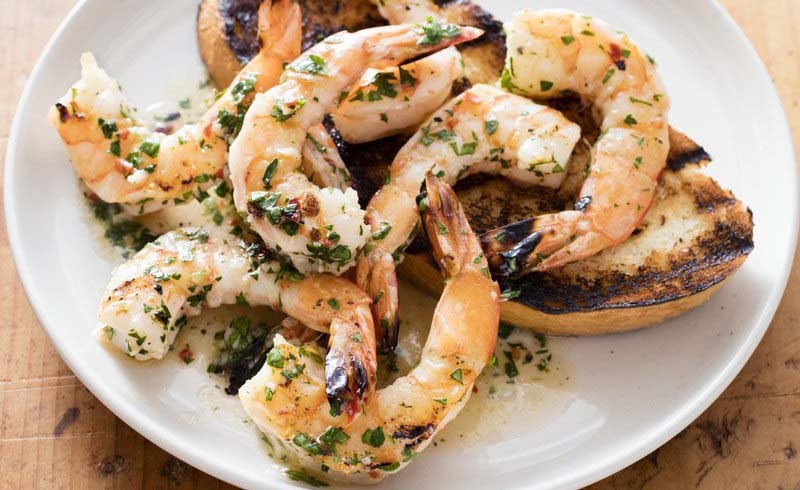 Shrimp can turn from moist and juicy to rubbery and dry in the blink of an eye over the heat of a grill. 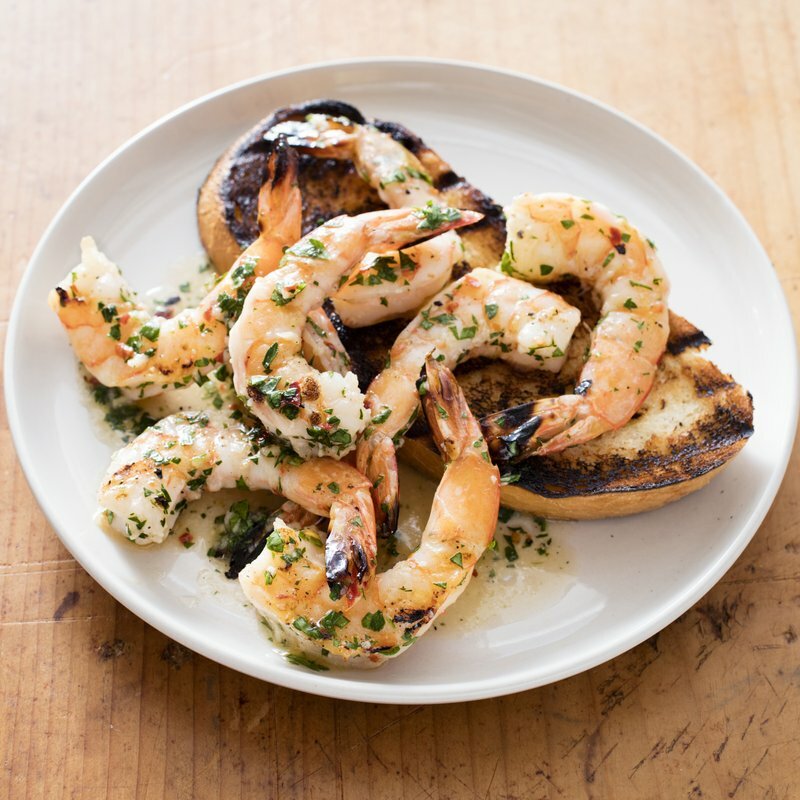 While grilling shrimp in their shells can shield them from the coals’ scorching heat, any seasonings you add are stripped off along with the shells when it’s time to eat. For juicy, boldly seasoned shrimp we decided to go with peeled shrimp and find a way to prevent them from drying out. We seasoned the shrimp with salt, pepper, and sugar (to encourage browning) and set them over the hot side of a half-grill fire. This worked well with jumbo shrimp, but smaller shrimp overcooked before charring. However, since jumbo shrimp cost as much as $25 per pound, we wanted a less expensive solution, so we created faux jumbo shrimp by cramming a skewer with several normal-size shrimp pressed tightly together. The final step was to take the shrimp off the fire before they were completely cooked and finish cooking them in a heated sauce waiting on the cooler side of the grill; this final simmer infused them with bold flavor. The flavors of the sauce can easily be changed to taste; one variation is included here. To fit all the shrimp on the cooking grate at once, you will need three 14-inch metal skewers. Serve with grilled bread. For the lemon-garlic sauce, combine butter, lemon juice, garlic, pepper flakes, and salt in disposable pan. For the shrimp, pat shrimp dry with paper towels. Thread shrimp tightly onto three 14-inch metal skewers, alternating direction of heads and tails. Brush shrimp with oil and season with salt and pepper. Sprinkle 1 side of each skewer evenly with sugar. Clean cooking grate, then repeatedly brush grate with well-oiled paper towels until black and glossy, 5 to 10 times. Place disposable pan with sauce ingredients on hotter side of grill and cook until hot, 1 to 3 minutes; slide pan to cooler side of grill. Place shrimp skewers, sugared side down, on hotter side of grill; use tongs to push shrimp together on skewers if they have separated. Cook shrimp until lightly charred on first side, 4 to 5 minutes. Flip skewers and cook until second side is pink and slightly translucent, 1 to 2 minutes. Using potholder, carefully lift each skewer from grill and use tongs to slide shrimp off skewers and into pan with sauce. Toss shrimp and sauce to combine. Slide pan to hotter side of grill and cook, stirring, until shrimp are opaque throughout, about 30 seconds. Stir in parsley. Transfer shrimp to platter and serve with lemon wedges. Nutrition information per serving: 243 calories; 131 calories from fat; 15 g fat (6 g saturated; 0 g trans fats); 235 mg cholesterol; 1258 mg sodium; 3 g carbohydrate; 0 g fiber; 0 g sugar; 24 g protein.